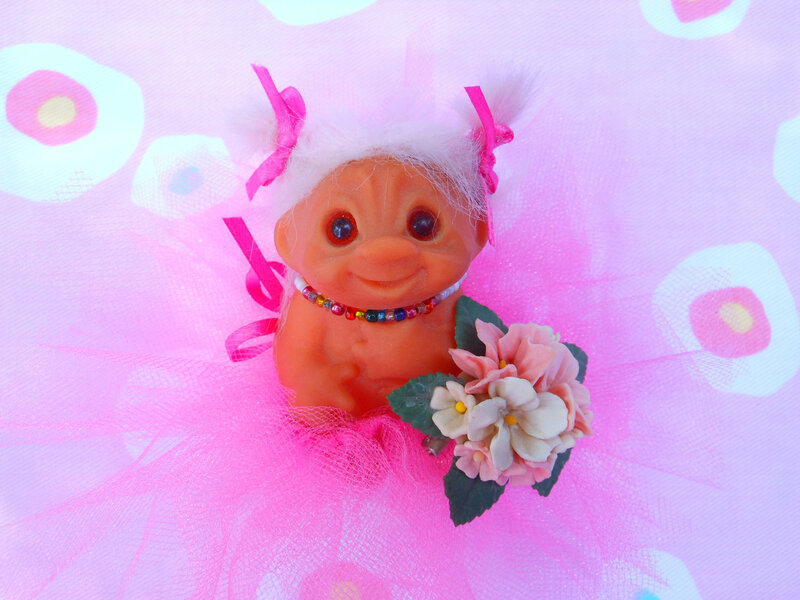 Ah, the Troll Ballerina. Never has there been such a contradiction – the grace and beauty of ballet teamed with the slightly hideous old-troll-ness of “Belle” (a 1960s doll with pink lambswool hair). For sale at Maggie’s Klosets, along with some old army boots, jewellery and a fairly disturbing cat brooch. Now, if you’re afraid of clowns, then this could well be your worst nightmare. 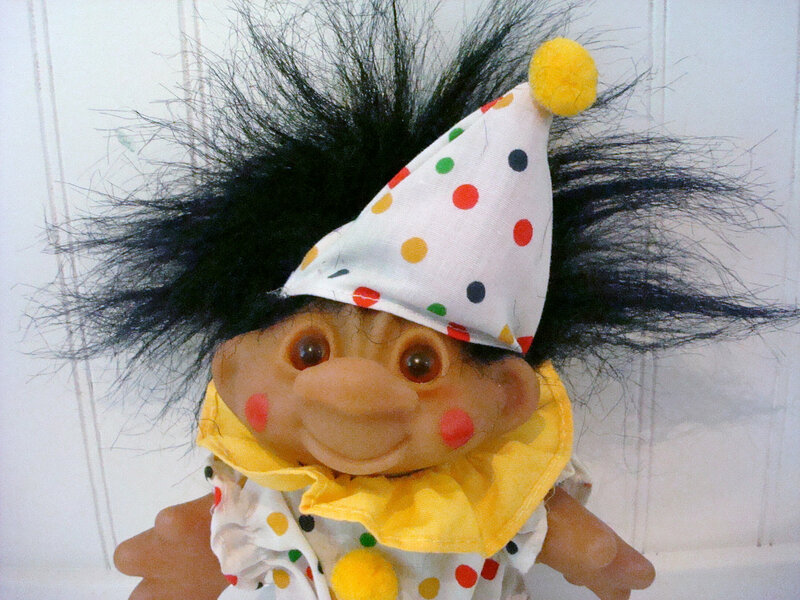 As if trolls weren’t scary enough, this guy has been frocked up and his vacant stare and rosy cheeks are enough to make anyone think he’s more of a Stephen King clown than a roll-up, roll-up fun sort of clown. 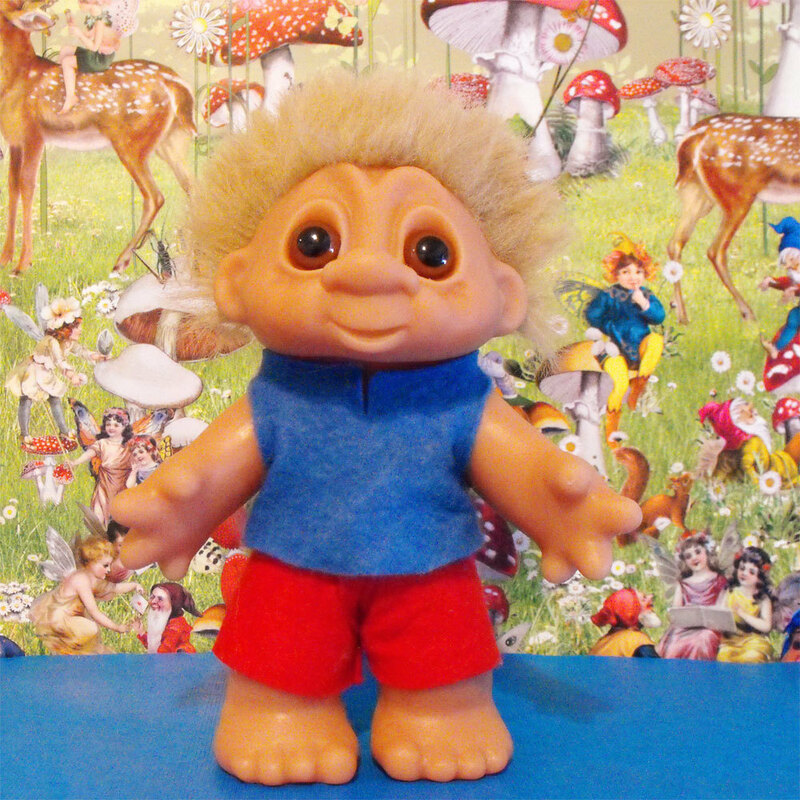 On sale at Snap Vintage, he is another DAM troll from 1986. I know that because there is a photo of a stamp on his clubbed foot that says so. If there’s a gym junkie in your life, or an old aerobics tragic, or someone with a withered face who likes leg warmers and leotards, this may be the troll for them. 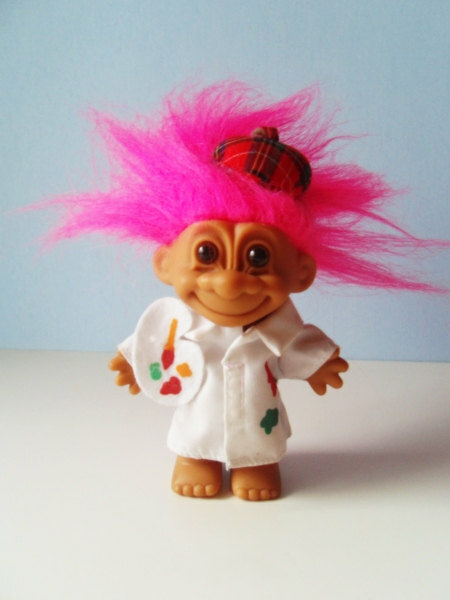 It’s a vintage Russ troll doll and it’s scary. 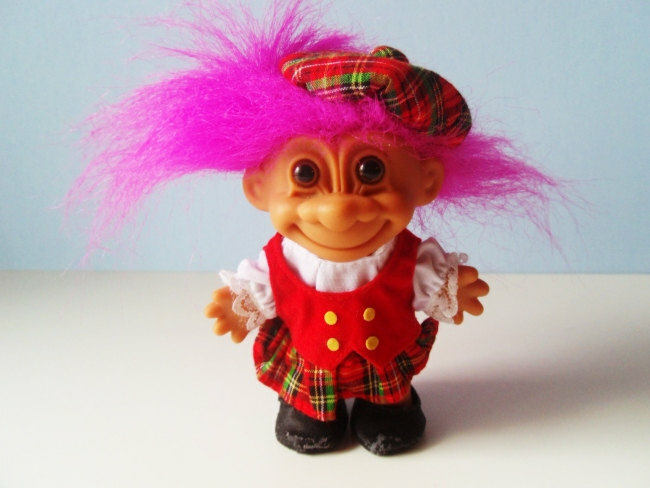 Not sure that the face matches the body, but I think anything goes in troll world, so whatevs. This great shop Plush 26 also features this frightening troll baby. But I don’t think you should give it to any new mothers, just in case they think you’re being mean. And the same shop sells a few other beauties that I wanted to share: the limited edition Russ “Troll around the world” from Scotland, a bonnie wee chap that makes me wonder what other nations’ trolls looked like in that collection…Or the Troll Artist (presumably from the “Career Trolls” collection to inspire kiddies to live their dreams, just like the trolls). He looks suspiciously like the Scottish troll with a different jacket, but I’m sure that there’s more to it than that. 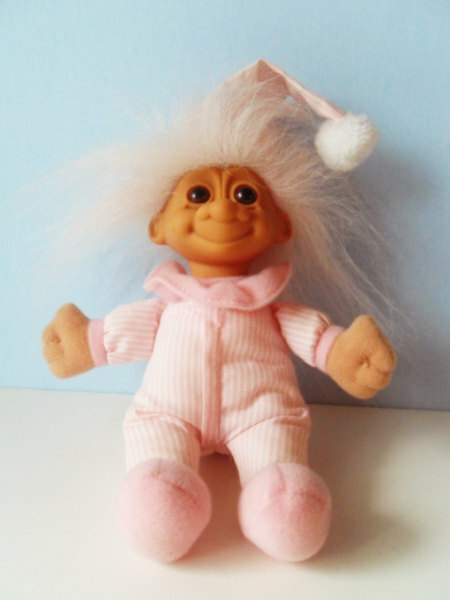 Or perhaps you’ve always wanted to turn a little person into a troll. 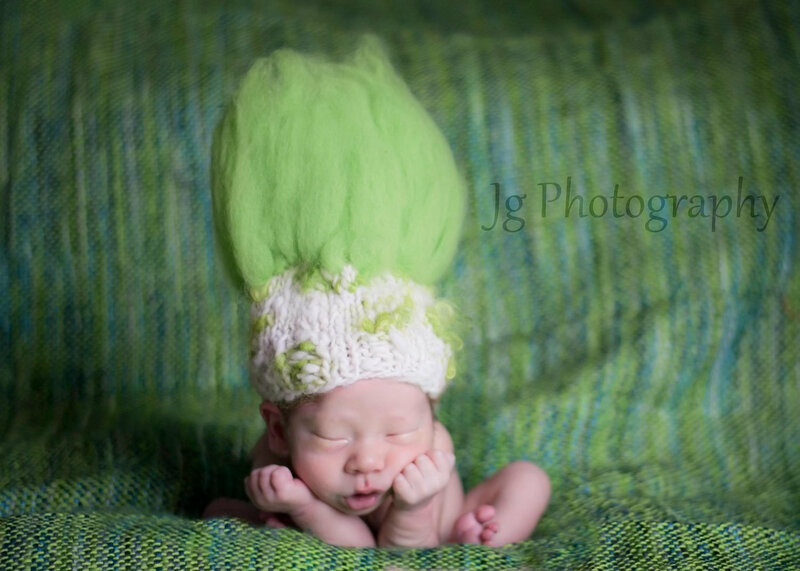 In that case, you can buy a knitting pattern for this troll hat from Petal Knits and whip up a creation that’s sure to scare little people and big people alike. 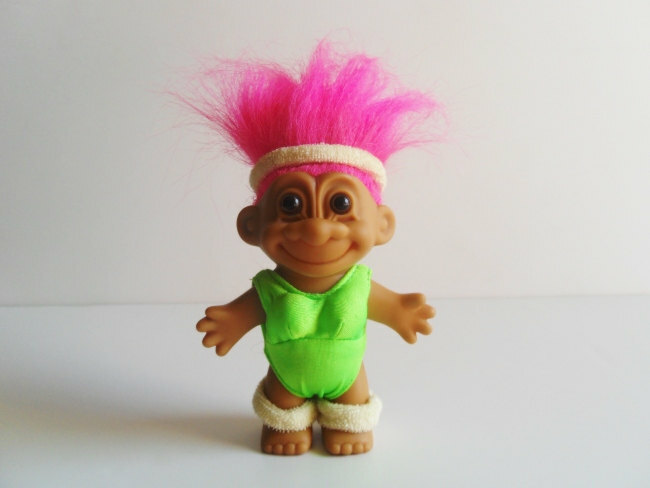 Whatever your style, no doubt there is a troll doll just for you. With big beady eyes, a mop of bright hair and a giant fixed smile, what’s not to love?